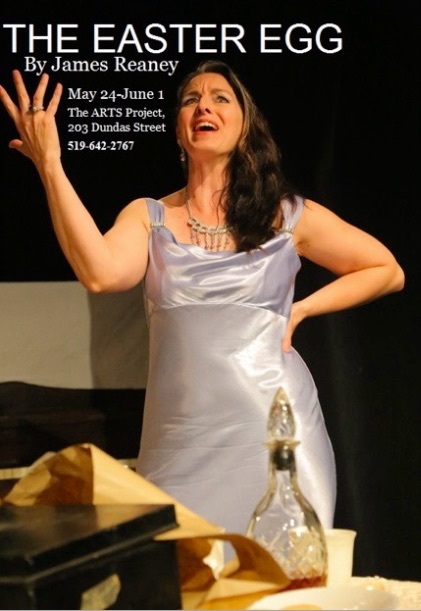 On May 24 to June 1 in London, Ontario, come and see the AlvegoRoot Theatre Company’s presentation of James Reaney’s play The Easter Egg. The Easter Egg is directed by Jason Rip, and the performers are Kim Kaitell, Adam Corrigan Holowitz, Maya Wong, Demis Odanga, and Chris McAuley. To buy tickets, call 519-642-2767; Adults $15, Students and Seniors $10. Pamela Terry Beckwith (1926-2006) directed James Reaney’s The Killdeer in 1960. He always referred to her as “my first director,” and he dedicated his second play, The Easter Egg, to her. She directed the first production of The Easter Egg for the Alumnae Theatre in November 1962. Behind Easter Egg literally lies a collection of glass Easter eggs I made from 1945 to 1955, aet. 19 and over. Found my first one in a store on Harbord Street, an old grocery and sundries store out of the 1910 era. […] In Stratford, Le Souder’s Second Hand Store also kept getting a supply as attics from the eighties and nineties descended to the auctioneer’s gavel. Have never been quite sure of their cultural use; I think they were given to children at Easter. Some of them are as small as hen’s eggs and I have heard of these being used as nest eggs; others are large — a bit larger than a goose egg. Could they have been made at the Hamilton Glass Works? 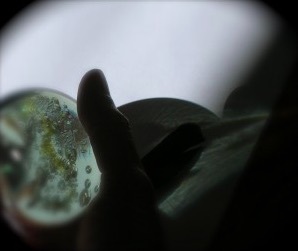 […] Milk glass blown or moulded, painted with flowers, rabbits, chickens (a cherub hatching out of one I didn’t buy), glowing with trapped pearly light — such glass cannot fail to set the story-telling instinct free. So a godmother gives a boy a glass Easter egg; he is drowning in an evil world and the present could float him to a shore. Someone steals the egg and the boy goes under a wave of word-blindness and numbness. Fourteen years later the Easter egg is found again and…. Bethel and her setting were suggested by stories told at an academic party in Kingston; stories about the past on a campus somewhat farther east. Nearby Garden Island supplied the ghost story of a girl tied to a fence for stealing a twig of small fruit. To my astonishment I ran across the basic for the story in the London Times,* 9 October, 1846 (No. 84). I think the heading is ‘Gooseberry Case on Garden Island’ and the owner of the gooseberries had the child brought up in court for stealing one! Confinement beneath a cellar door rather than tying to a fence was the cruelty practised. […] I know perfectly well that in real life no one marries somebody because she got him to kill a bat; but here, in this story, they do you see.